GET YOUR SILK SCARVES WHILE SUPPLIES LAST!!! We are proud to offer these limited edition 100% Thai silk scarves. Wear your art! LilyO's moves Tom's watercolors from the rigidity of paper to the fluidness of carefully selected fabrics. 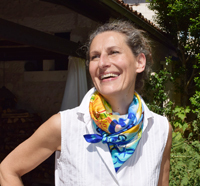 Now you can take your joie de vivre out on the town with artful scarves and shawls. LilyO's products are just too beautiful to stay home!